I'm going to shout at you today – YOU MUST READ THIS BOOK! Rant over. 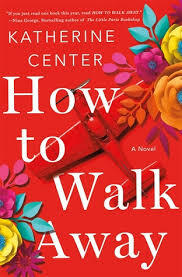 How to Walk Away grabbed me from the get go and I read it over 2 days – not getting to other things as a result. If I tell you the basic premise of the book, you might say – oh, one of those books about people who are badly injured and how they cope. But in a funny way the facts were a bit incidental to my enjoyment. This book is seriously funny – and wise, charming and hopeful. And, yes, a bit sad. The writing is marvellous. This one is making it onto my Top 20 although it's going to be difficult to decide which other book to delete! Just requested the ebook from the library...I'm 9 of 9 holds...must be good!